it is time to learn how to plug holes. with the Tourniquet Tag from Advantage Arms. a tourniquet needs to be on at all times and ready for deployment at all times. Or "When seconds count, the Paramedic is minutes away." Thus, your tourniquet needs to be ready to go at all times. the tourniquet you are to note the time and date. But what if you have forgotten your sharpie that day, or lost it in the heat of things? Advantage Arms has the solution. It is a permanently mounted Tourniquet Tag. 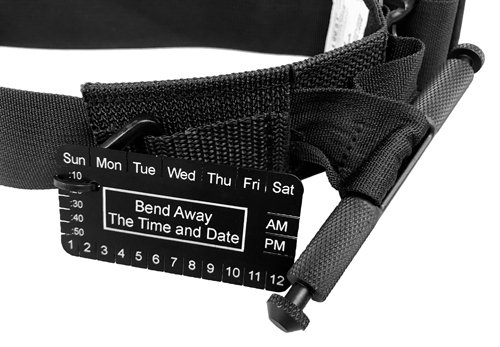 You simply fold over the Time and Day of the Week on our ridged, anodized aluminum tag. and can never become over saturated, thus making it impossible to write on. Also, it is made to work with any of your existing tourniquets.